Though I’m sure I probably ran across their name now and again (their name makes them sound like they’d be much heavier than what they are), it wasn’t until October 2006 that I got my real introduction to this band. Believe it or not — it’s all thanks to that super cheesy 1987 slasher flick Sleepaway Camp II: Unhappy Campers in which “Desperate to Survive” is featured. “Methods of Madness” and “Killer Elite” are included in Sleepaway Camp III: Teenage Wasteland. Anyway, “Desperate to Survive” is a great heavy metal ballad and is easily my favorite song on the album but the rest of the tracks are no slouches either! “For the Love of Money” and “Killer Elite” are top notch songs as well. The album is just great ’80s metal all around with great guitars and great vocals by Vescera (who would sing for Ynwgie Malmsteen and Loudness not too long after this). Even the bonus tracks for the Metal Mayhem reissue are very good. The only complain I have about the reissue is the lame cropped cover and border. To all of you who plan on reissuing albums — STOP DOING THIS. It’s so lame and makes these covers look so ugly. I’m not even sure what the point of it is. Just leave the original cover as is or if you feel you absolutely have to signify it’s a reissue, follow what the Judas Priest reissues and put a thin color border around the album art. 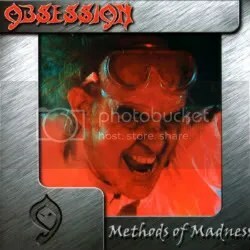 Though I can’t speak for the rest of the band’s catalog yet, Methods of Madness is certainly a lost ’80s metal classic. This band should’ve made it big, it’s sad they didn’t make another album after this one until 2006! Well worth seeking out.